Especially for New Year I’ve got some reviews about shimmer/glitter/glow products unto my planning to get that lovely glowy look with NYE! So that we can start the new year all sparkling! I choose a few products that looks to me worth to write a review about. One of these products is from the well known mythic oil line from l’oreal, it’s a shimmering oil for your body and hair! I find the packing so perfect! It’s a stylish glass bottle. The oil itself is a caring oil for the skin and hair with pretty golden glitters in. This is more a product to use in the summer, but of course is this one perfect for special occasions in the winter like New Year! How to apply this oil? But luckily it works much better on my body! It is hard to photography all the glitter onto my skin because these are very subtle! They give a very subtle but beautiful, healthy glow on your skin. As you can see below my skin looks so glowy, love it! So this product is 1000 times better on my skin that in my hair! It’s just perfect to let your skin shine! And it also takes care of your skin! Just perfect! For it the hair is this oil a big nooo! But for your body is this a big hell to the yes! Of course is this oil more ideal for the summer. But if you were a dress with NYE you can perfectly use this for your legs. It gives your skin a beautiful and healthy glow. I’m going to use this spray so much this summer for my arms or legs! It’s just perfect to let your skin steel the show! 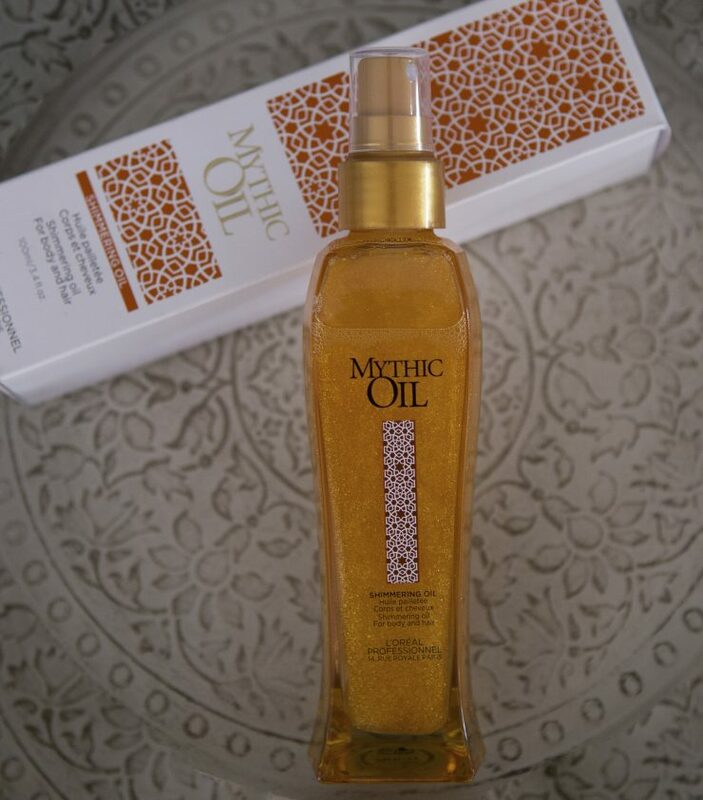 The shimmering oil from l’oréal mythic oil contains 100ml and this price is around €29,99 by the hairdressers. But after some searching I found this oil a lot cheaper online with prizes from €13 till €19. Ja die glitters zijn zeker enorm leuk! Hij is prachtig voor de huid, voor het haar wat lastiger zie ik. Mooi product! Ik vind zulke producten altijd heel fijn in de zomer. Dit lijkt me een fijn product voor het lichaam. Jammer dat hij voor het haar wat minder goed werkt.